In the world around us there are many examples of vortices: tornadoes, whirlpools in a sink or tub, swirling vortices in rivers and oceans and, of course, hurricanes. You can make your own vortex to do experiments with. 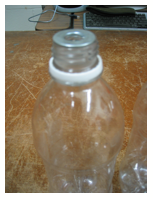 Fill one of the bottles about 2/3 full with water, place the washer on the mouth of this bottle. Next invert the second bottle onto the washer and tape them together firmly. Turn the two bottles over so the full one is on top. Swirl the bottle vigorously to start the water spinning. Set the bottles down and watch the vortex form. You can make the vortex more visible by adding a little food color to the water or some glitter or little foam beads. See how big you can make the vortex by spinning the water faster. Experiment with washers that have different size holes. See what happens when you tilt the bottle after a vortex has formed. The tornado you see is actually a vortex. In a vortex, the fluid on the outside has to move faster than the fluid on the inside to keep up. This is why strong winds can be felt far away from the tornado and the eye of a hurricane is calm. 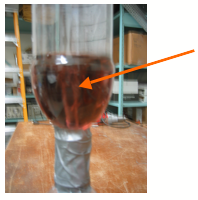 Another experiment that you can do with vortices is quite simple and yet demonstrates an important principle of meteorology. Pour some very hot water into the cup or pot and stir it slowly in one direction so the water is rotating slowly (you may want to put some food color in so you can see the water better). Next place a small ice cube at the center of the rotating water. With a little luck you should see the ice cube start to spin faster and faster until it is turning much faster then the water around it. This occurs because the melting ice causes water to sink underneath it. This in turn draws in some of the warm water from the top edges. This water coming in from the edges is what spins the ice cube faster. This is the same principal that causes some tornadoes and whirlpools in rivers to spin up. You may have to experiment with the position of the ice cube to make this work well. But then, experimentation is half the fun!